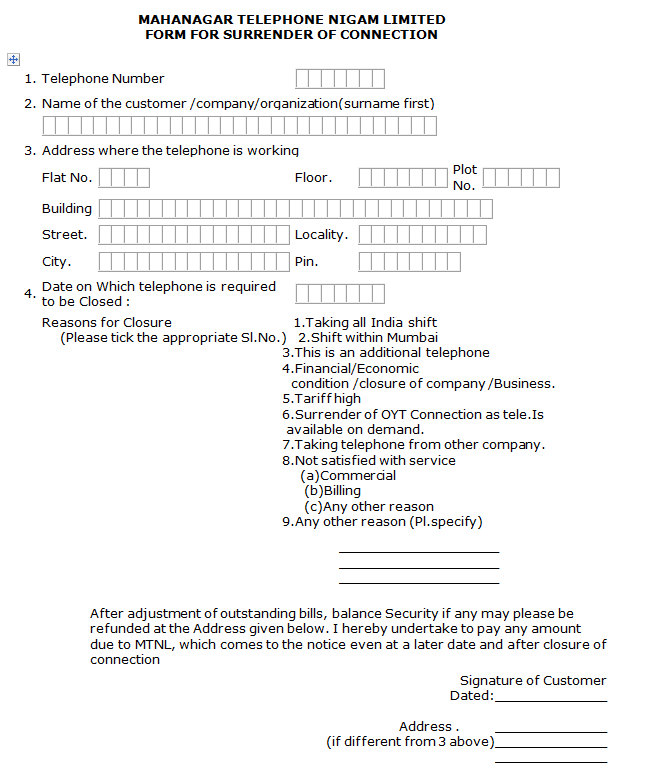 How to apply online to deactivate MTNL and BSNL landline or broadband connection? Willing to surrender your MTNL or BSNL landline telephone? Are you unsatisfied with services provided by MTNL/ BSNL. Here is sample letter format to write application for closing their connection and all other things you should know for this purpose. Every second person is now having a mobile in his/ her hand and so the need of landline telephones has become negligible. Most of the Indians have MTNL or BSNL connection at their places which they bought joyfully years ago. But better services from the private sector and reduced tariff plans have forced us to close our years' old telephone connection. I also decided to surrender my MTNL connection and went to Sanchaar Haat or MTNL office in my neighborhood. You might not have the privilege to have a Sanchaar Haat in your neighborhood, so, first of all, you need to identify your correct Sanchaar Haat. Next step is to write an application for surrender of connection. I have provided two types of formats for your convenience. You can choose any as per your liking. You need to carry items mentioned here along with the application. Application in format provided below. Your old instrument (telephone set with MTNL/ BSNL stamp, cable, adapter etc. Take modem also if you are willing to surrender MTNL/ BSNL broadband connection too.) My connection was years old and the telephone set that MTNL had provided us was no longer available with us. Hence I took the simple telephone set (without MTNL stamp). Though the officer there said that it is not acceptable but he and SDO there was very kind by nature. So he accepted that set and said, "I will manage". Self-attested photocopy of aadhar card/ ID proof of the person who owns the connection. Original copy or duplicate copy of latest phone bill. All bills must be paid. Here I am providing you sample letter format for the closure of phone connection. You can also download the form by clicking on the image here and taking a print out of the same. 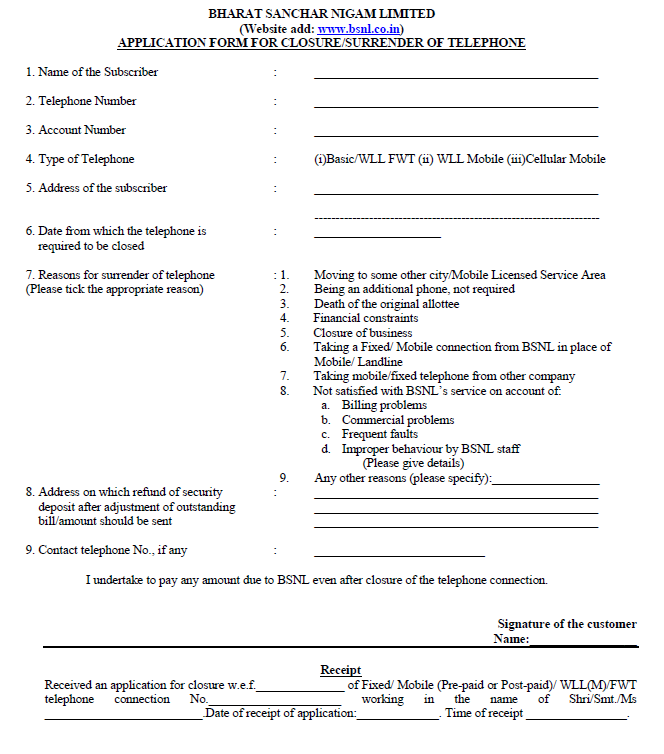 Though you can use one format for both MTNL and BSNL connections, I am providing an application form as provided at BSNL website too. Image courtesy: MTNL and BSNL official website. I am a user of telephone connection xxxxxx, which is installed on full address, and which is on the name of Mr. Alok Nath. I have paid all the bills and cleared all dues against the said connection. I want to surrender the connection with immediate effect. I have also returned all instruments originally provided to me. Don't forget to take a picture of the duly signed application form (which you submitted) as they hardly bother to provide you any receipt. SDO at my nearby MTNL office told me that I will receive a cheque of Rs. 1200 by the name of connection holder within 2-3 months. Note: Try to visit in last week of the month. They have a billing cycle from the first day of the month to the last day of the month. Next bill is generated on 8th or 9th day of the succeeding month. You have to pay that bill also. Also, don't visit near lunch hours (1 PM -2 PM). The SDO and officer at my place were quite cooperative and hence it hardly took 30 minutes. But you may not be lucky enough and may have to interact with non-cooperative staff.